Braces are a common orthodontic treatment used to straighten crooked teeth, improving oral health as well as the quality of the smile. This treatment uses brackets and wires to achieve these goals. They remain affixed to the surfaces of the teeth throughout the entire treatment period. If your child has been given braces, it is important that they take good care of them to ensure that they are able to do their job properly. Great Grins for KIDS - Portland is here to help. Even with braces, it is still important to brush at least twice a day. It is also recommended that your child brushes after every meal. Brushing is essential for eliminating plaque and bacteria buildup from the surfaces of their teeth, reducing their risk of developing cavities and other oral health issues. 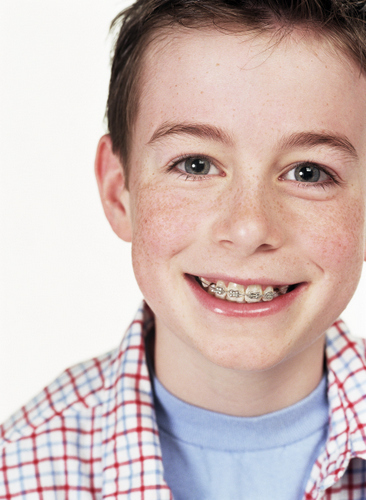 While wearing braces, however, your child will need to adjust how they brush. Brushing with braces is different from brushing normally, and requires greater care. Using a soft bristled brush, the head of the toothbrush should be angled against the brackets. This helps your child to more effectively clean around them. Your child should also make sure to brush the backs of the teeth as well as the chewing surfaces. Toothbrush bristles may fray faster than normal. If you or your child notice the bristles begin to fray, it is important to replace the toothbrush, even if it is earlier than three months. In addition to brushing, your child should also be flossing at least once a day. Like brushing, their flossing habits will need to be adjusted to ensure that their teeth are properly cleaned. It can be difficult to get the floss underneath the wires, so a floss threader is recommended. Once the floss is behind the wire, your child should floss between their teeth as well as under the wire and around the brackets. This habit is essential for removing trapped food particles, plaque, and bacteria. Make sure that your child also flosses behind their very back teeth as well. Helping your child to protect their braces is essential for ensuring that the treatment provides the most effective results. Your child should avoid eating foods that are extremely hard, crunchy, chewy, or sticky. Foods like whole apples, gummy candies, hard candies, crusty bread, and more can cause brackets to become dislodged and wires to bend or break. These issues can cause delays in treatment, especially if not addressed right away. If your child plays sports, it is also essential that they wear a mouth guard. However, they cannot wear their normal mouth guard with braces. Doing so can increase their risk for injuries. Instead, we can create a custom mouth guard that will accommodate their braces and provide them with optimal protection. Even with proper care, braces emergencies can sometimes still occur. Your child may have a wire come loose or a bracket pop off. When a braces related emergency arises, it is essential to schedule an appointment right away. The sooner treatment is provided, the lower the risk of delays in orthodontic treatment. Taking care of braces is essential for ensuring the oral health of your child as well as the effectiveness of their orthodontic treatment. If you have any questions or concerns about caring for braces, call Great Grins for KIDS - Portland today at (971) 470-0054.